I have this theory on the etymology of the names of places in Karnataka. As we whizzed by road sign after road sign on the NH, I wondered if a bunch of really imaginative children invented the names of the places during some ingenious game. There’s such whimsy in the names, uninhibited in their use of vowels, so much so that you can roll them in your mouth like some sugar-dripping, orange-staining mitai. Well, no surprise that, given the characteristic Kannada proclivity for all things sweet. We were headed for Hassan and had three delicious-sounding names on the itinerary. Belur, Haleebedu and Sharavanabelagola - known as the ‘Golden Triangle of Karnataka’. Of course, this is just the take of the uninitiated. True to their mellifluous tones, the names, in reality translate into poetry. Our immediate destination for one, gets its name from the resident deity of the Hassanamba Temple, the smiling (hassana) goddess (amba), which despite her pleasant countenance, makes an appearance only once a year. Hassan is about three hours away from Bangalore, and we were hoping to get there to catch a good bit of sleep. We had a lot of walking on tomorrow’s agenda. We checked into our hotel well before 10 and decided to set out for Belur’s Oreo-cookie coloured architecture by 8 in the morning. Hassan has some really good hotels and make a good stop when visiting the area. A little over an hour after our start from Hassan and we were at Belur. The precincts of the Channakesava Temple are a head-on clash between the past and the present. The structures are old but the kitschy-coloured ware strung out for sale is all soda-pop and plastic. On the steps, just where we left our shoes, there were souvenir-material stuff. Hawkers holding small metal Hoysala figurines, stone bric-a-brac and what not, personally came up to tourists, offering their wares. And thereon ensued a battle of bargains. But when you arrive at the temple, you hardly notice these hawkers. The populous gopura arrests your attention for a good five minutes. Unlike the colourful gopuras one often associates with South India, this temple that dates back to 1116, has a single-coloured gopura that stands in beautiful contrast against the starkness of the Chennakeshava Temple. Chiselled out of soapstone, with exquisite sculpturing covering its every inch, the temple took more than a century in the making. As the story goes, Veera Ballala II completed this paean in stone commissioned by his grandfather, King Vishnuvardhana, to commemorate the victory of the Hoyasalas over the Cholas. I found myself wishing I’d paid more attention to my history lessons. Who knew such exciting stories what those post-lunch history classes were about, when these very names droned like somnolent bees over my head. Just when I was about to seek the rescue services of Ms. Wikipedia, we were approached by a guide (licensed, official and comes with a receipt, mind you) who offered his services for a fee of Rs. 200. Never have I spent Rs. 200 more wisely. Over the next two hours, we had a rather absorbing history lesson, which was magical realism at its flamboyant best. 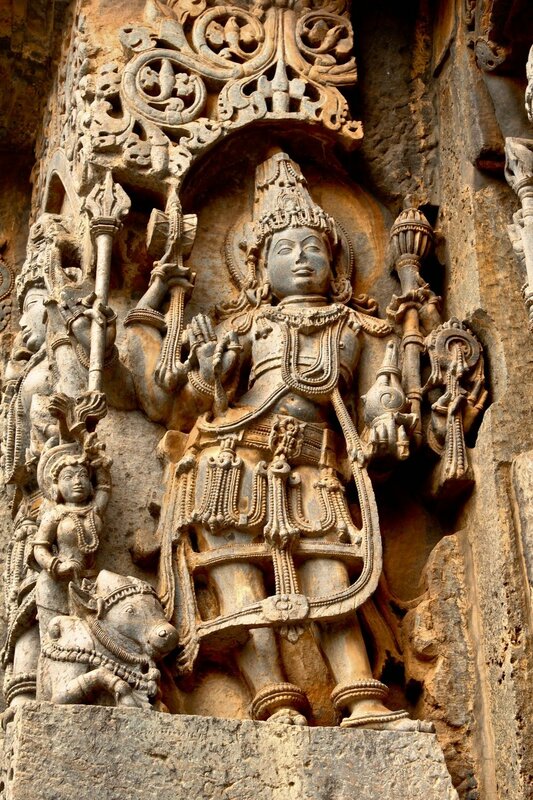 The Hoysala Empire gets its name from a legend that, of course, features a valiant hero. Sala, the legendary founder of the empire, enjoyed a larger-than-life persona and it’s believed that when a tiger crossed paths with the brave teenaged Sala and his Jain guru, the teacher handed an iron rod to the boy and said, ‘Hoy, Sala’, which literally translates into ‘Strike, Sala.’ Sala killed the tiger, and thus was blessed by the guru who instructed him to form an empire. The star-shaped base is a motif of Hoysala architecture, as you'll see at the Chennakeshava Temple, which gets its name from Chenna (beautiful) Keshava (the first avatar of Vishnu). Each corner of the 32-pointed star that forms the base are in perfect alignment with each of the corresponding edges of the temple, right from the top to the bottom. The winged figure of Garuda, paying obeisance at the temple door is an unmistakable indication of whom the temple is dedicated to. From there, begins a saga of what can be best described as the epitome of human craftmanship. 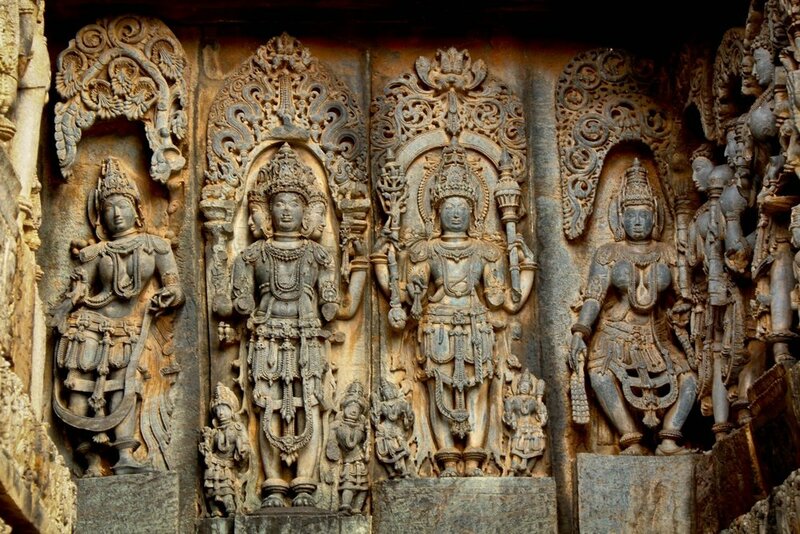 The detail of the aforementioned carvings that cover the exterior of the temple, haven’t succumbed to the blurring of time. Sure, vandalism has taken its share along the centuries, with some pieces missing altogether. But most of it is more than less there. Standing right at the entrance of the temple is the iconic depiction of Sala attacking the tiger, also the royal emblem of the Hoysala Dynasty. The iron rod, though, is depicted as a dagger. The walls of the temple are covered with depictions from the Hindu texts, scenes from everyday life in the day and age of the Hoyasalas and women - really, really beautiful women. The Chennakeshava Temple really raises the bar when it comes to defining feminine beauty - 38 madanikas or celestial nymphs who are impossibly slim of waist, wide of hip, sharp of feature and round of breast haughtily look down at you from the eaves of the temple as they have for centuries. Obviously, photoshop wasn’t the dawn of unrealistic standards in beauty. Our guide was so caught up by these fashionistas caught up in their day-to-day activity of being maddeningly beautiful, he kept bringing up how fashion keeps coming around. And like as if the artisans didn't harp on beauty enough, inside the temple, beside the main deity stands a voluptuous epitome of a true beauty or a Padmavati. The Mohini Pillar features a life-sized nymph with a face like the full moon, eyes like twin fish, eyebrows like well-strung bows, a jewel-like nose and a sensual mouth. The forehead, the nose and the chin is proportioned such that they form a third of the face each and the face on the whole is a seventh of the entire body. Swan-waisted, moon-breasted, elephant-hipped and a second toe that dwarfs the big toe, indicating a strong dominating disposition - well, hello femme fatale! Ladies and gentlemen, a true beauty - quirks surely didn’t have much currency in these parts! People literally did worship beauty back then. Made entirely out of black soapstone, the temple has a surreal feel to it. Its threshold is like a passage between two different worlds entirely. One minute you’re squinting, shielding your eyes from the sun, practically hopping barefoot on the hot stone. The minute you step inside the doorway, your feet actually embraces the cool floors, pupils dilate in the half light and your body relaxes to a state of almost meditative calm - the whole of you just glad to be out of the sun. But that doesn’t mean you can afford to cut short your circumambulation around the temple. The madanikas or the shilabalikas, with their unearthly beauty are magical to say in the least and got me thinking that perhaps, they had some role to play in making worship more mainstream. Our guide made it a point to highlight the melancholy of the darpanasundari or the lady with the mirror. “She is very beautiful. But her face, very sad expression. Maybe she misses her lover? !” Yes, the highly romanticized beautiful woman, whose earth-shattering beauty is of no use to her broken heart - we’ve heard about her, haven’t we!? But that's just her, the other shilabalikas are far cooler - they revel in their heart-stopping beauty and are engaged in more narcissistic pastimes - hunting, making music, conversing with embellished parrots, dancing, powdering their noses and what not. It’s rather interesting how the craftsmen incorporated tiny details into the sculptures to paint a more vivid story and of course, outdo each other. Quite obviously he was contemptuous of today's fashion scene for its lack of originality! But Hoyasala's page 3 wasn't the only thing he pinpointed out - he told us all the stories, both myth and fact, highlighted every detail and threw in a good measure of local folklore. Not all the sculptures on the temple’s exterior are of dreamgirls. The base of the wall is covered in friezes of charging elephants (650 in all, every one distinct and unique from the other), horses and flowers, signifying strength, speed and beauty - the characteristics a ruler must possess. The walls also feature scenes and icons from the myths, including Narasimha dismembering Hiranyakashipu, a Ganesha statuette - that’s now known as exam Ganesha, as it has a devout following of students, who for some reason have attributed exam-related powers to it, Vamana begging “three-feet” of land from the benevolent asura king Bali, Durga slaying the demon Mahishasura and so forth. One of my favourites was this particularly violent depiction of Narasimha making mincemeat of two demons. While Narasimha was engaged in annihilating a demon, another one tried to come to his rescue. Narasimha, enraged even more by this interference, turns around and pulls the skin clean off the second demon's face. The artisan has captured the very momentary stupefied gawk of surprise we all have before we begin to howl in pain. Just by capturing this moment, one can imagine the entire sequence that preceded and followed the scene. The erotica though, in Hoyasala architecture, is on the discreet side - peppering just some alcoves and niches. It’s believed that the muse who lend form and figure to the shilabalika sculptures was none other than the queen of King Vishnuvardhana. Queen Shantala whose grace and beauty was legendary, was a dancer of note, and participated actively in the goings-on of the Chennakeshava Temple despite being inclined towards Jainism. Inside the temple, it's really cool. And really dark. We’d read so much that the carvings inside the temple surpass the ones outside by miles and that they shouldn’t be missed for the world and we didn’t even have a torchlight on us! Again, our guide comes to our rescue. For a fee of Rs. 20 (again, with receipt) he not only got a huge spotlight turned on for us, but also trained it on every single noteworthy detail for our benefit. Adjacent to the sanctum sanctorum where the bedecked, 9ft deity of Sri Keshava is worshipped even today, is a disc of a platform flanked by pillars called the navaranga or the dance hall where Queen Shantala performed as an offering to the main deity. Each of the four pillars that immediately surrounds the platform has its own madanika, amongst which, one of them is Queen Shantala herself. In the yellow incandescence of the spotlight, the statues though made of stone gave off the sheen and finish of metal. All the 48 pillars in the navaranga are unique, amongst which the Mohini Pillar and the Narasimha Pillar are the most remarkable. The Narasimha Pillar, a big, thick godfather of a pillar which once rotated on its base, is like a miniature of the temple and has a thumbnail version of all the sculptures on the temple. A single patch, conspicuous in its emptiness, is believed to be an open challenge to other craftsmen by the artisans to surpass the original carvings. In dark niches, mythical folk and animals carouse in age-old games, keeping time with the general celebratory mood of the temple. The Hoyasalas had really high standards. Period. And it’s evident in niche of the Chennakeshava Temple. Amongst which, is a lamppost that’s confounded people for eons for standing its ground with no support, no base, no fixtures whatsoever - and had us gaping in wonder like it did with every other tourist before us. The 42 ft gravity pillar is a mystery of sorts. It stands on three points and balances on its own weight and in its heyday, was probably what floodlights are today. Unlike Haleebedu, the Chennakesava Temple was spared the damage and plunder of the Delhi Sultan’s invasion and what little visible damage is attributed to vandalism. But largely more or less intact, the temple stands out like the brightest jewel in the complex which has other temples like the Kappe Channigaraya Temple, the Temple of Soumyanayaki and Ranganayaki the beloved of the Sri Chennakeshava and the Vasudeva Sarovara. By the time we were done, the sun was well over our heads and we were going blind with hunger. We headed back to Hassan for a quick lunch. As that quintessential fork in the road that connects Belur, Halebeedu and Shravanabelagola, Hassan has all the trappings of a stopover - you have a sizable pick of good hotels: cheap, budget, luxury, tour operators and even a couple of noteworthy Hoyasala remnants like the twin temples and the shrine of the resident goddess. But post lunch, it was the Hoyasala capital we were headed for. About 16km away from Belur and about 30 km away from Hassan, Haleebedu is less than a stone’s throw away. While it was known as Dwarasamudra in the 11th century, its present name, Halebeedu that translates into old city or destroyed city is like an endless lament for all the things the once-magnificent city has lost. A city that was unparalleled in its kind back in the 11th century, it never really recovered from the pillage by the armies of Alauddin Kilji and Muhammad Tughlak - the unmistakable edge in our guide’s voice when referring to that episode in history is an indication that it’s still a sensitive topic. “The palace, madam,” he says, pointing to the main road and bereft of any palatial traces, whatsoever, “it was nearby. But everything the muslims from Delhi burnt.” The guide at the Hoyasalaeshwara Temple cost us a little more than the one at Belur, but nevertheless was worth it, once we’d figured the syntax of his Kanglish, i.e. The guides are rather patient and don’t mind repeating for the benefit of the attention span that tends to wander, courtesy of the unkind 3 pm sun. The Hoyasaleshwara Temple with its twin shrines is the largest Shiva Temple built by the Hoyasalas and the deities Hoyasalaeshwara and Shantaleshwara were named after King Vishnuvardhana and his queen, Shantala. Set on the same stellate platform, the Hoyasaleshwara Temple though, is more ornate and bigger than the Channakeshava Temple. The same goes for the carvings as well and the guide can barely conceal the smugness in his voice as he gives us this piece of information. As the temple dedicated to the Destroyer in the Trinty, the wall sculptures on the temple exterior are action-packed and our guide delivers the sequence with Tarantinoesque flair. As opposed to the general six frieze style, this temple has an eight frieze pattern with elephants, lions, horsemen and floral patterns that symbolize the qualities of a good king. Again, no two animals on the 200m frieze are alike. Along with god’s creatures on the frieze which also include showy swans is the makara - a superstar of a mythical animal, with the body of a pig, the head of an elephant, teeth like a crocodile and a peacock’s tail - I had found the pet I would keep in the afterlife. The temple is flanked by a shrine dedicated to Nandi, the bull, Shiva's vehicle. Not only is it one of the biggest Nandi monoliths - so big that you feel insignificant and dwarfed by it - it's well-ornamented in the typical Hoysala style: extravagantly and with flourish, i.e. Behind the Nandi mantapa, stands a shrine dedicated to Suryanarayana, resplendent with his seven horses and Arunadeva. The main temple is divided into two quarters - one for the king's rituals and the other for the queen's. Along with the scenes from Hindu mythology, there is again depictions form everyday life. Along with the customary singing, dancing, there are also curious looking carvings of objects that look suspiciously like rockets, telescopes and even people in astronaut-like helmets. Possibly, Jules Verne wasn't the only one who saw these things coming. 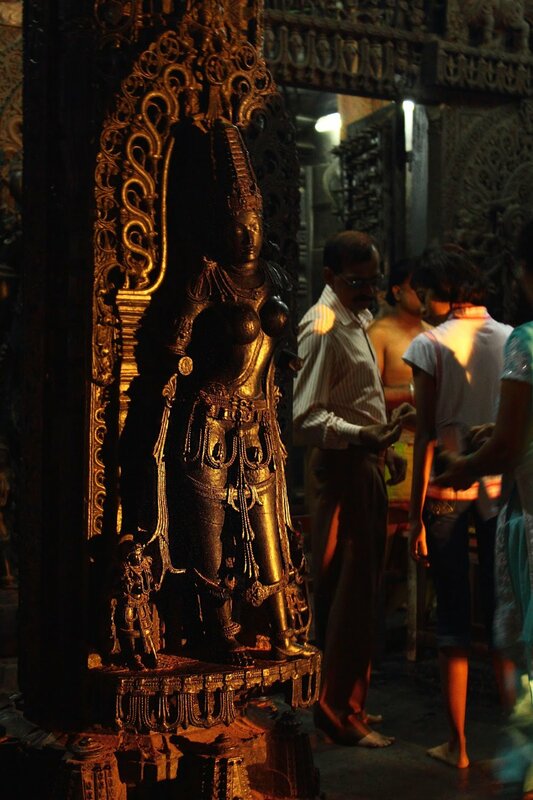 The artist's mastery can be seen in these carvings which capture the very essence of the scene depicted. For architectural buffs and those with a vivid interest in Hindu mythology, the Hoysala trail is a tourist circuit by itself. The nearby Kedareshwara Temple, the museum and the Parshwanatha Swamy Temple with 14 ft statue are a must-visit. The Veeranarayana Temple at Belawad on the Chikmagalur-Javagal highway has the rare idol of Yoganarasimha with a serene countenance. Along with being the largest Hoysala trikutachala (triple shrine) temple and boasting the most number of pillars (152 distinct ones in all) and a splendidly ornate roof, the temple is also designed in such a way that the rays of the sun touch the idol of Veeranarayana in the most becoming way - a sight that's especially spectacular on the 29th of March. 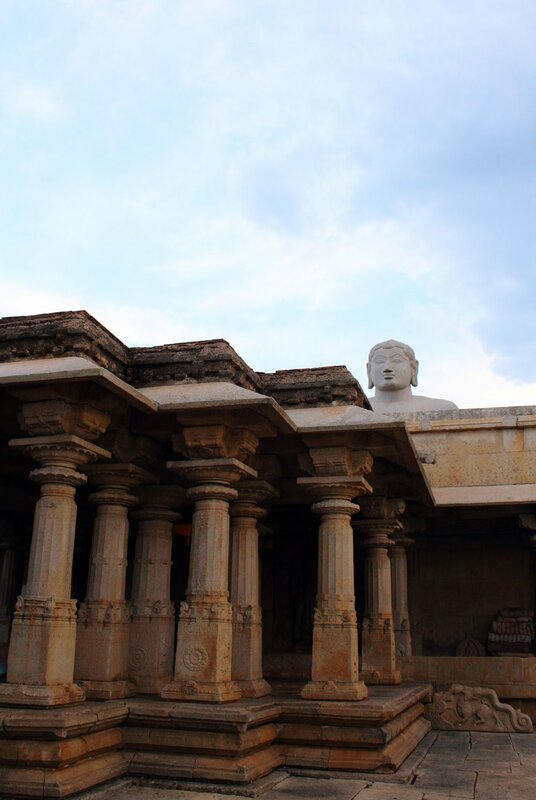 From here, we're headed for the last stop on Karnataka's Golden Triangle, Shravanabelagola - the Jain bastion. Absolutely wiped out after all that walking, we were out like light in the cab and woke up just in time to see the head of Lord Gometeshwara high up on the horizon, his calm gaze taking in all of his surroundings like a benevolent god. Sravanana Bela Gola translates into the White Pond of the Monk. There you have it - an entire sentence for a name. More whimsy; I like! We'd reached there well after 5 in the evening, so leaving our shoes and socks behind wasn't as bad on our soles as it was at Belur and Halebeedu. To climb up 612 steps, barefoot on an Indian afternoon would hardly have been a cakewalk. From the foot of the hill, the climb looks like a hopscotch up. But five minutes into the climb, and 612 steps felt like six thousand one hundred and twenty steps. I found myself wanting one of those dholis - a facility of a cane chair tied to two poles, carried by four nimble footed men, for those who can't handle the climb. 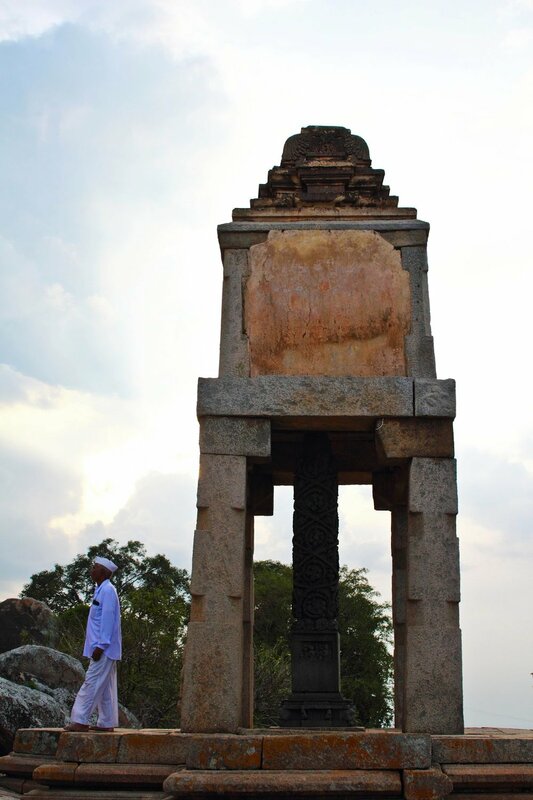 Shravanabelagola is an important stop for the Jain pilgrim - the elderly, the frail, the unwell, all of them long to set eyes on Lord Gometeshwara - who stands 58 ft tall at the top of the hill. At no point of the climb up do you even see a peep of the whole point of this climb. The massive statue we spotted from the cab was nowhere in sight and I suddenly had a feeling of having had boarded the wrong bus. At 58 ft, this monolithic statue of Lord Gometeshwara is one of the world's tallest, free-standing statues and therefore shouldn't be hard to miss, especially on a hill, right? Wrong! The Indragiri Hill is one that's warped in legend and hence no common hill. Circa a thousand years ago. The sons of the first Jain tirthankara Bharatha and Bahubali come of age and aspire for the throne. A battle ensues and Bahubali, who was built bigger, wins. But upon winning, he was filled with remorse, renounced all that he'd won and went in pursuit of liberation. His brother then had a statue of Bahubali erected, which disappeared under ant hills and creepers, and only the truly pious could see through to his true image. Until Kushmandini Devi, the goddess who watched over Bahubali - whose shrine stands at the top of the first flight of stairs (yes, there are more) – visited Chavundaraya in a dream to shoot an arrow from the Chandragiri Hill to find the statue that he sought in vain. The arrow landed on Indragiri and the figure of Gometeshwara as we know it now appeared. The statue was carved from a single piece of stone under the supervision of Arishtanemi about a thousand years ago. So where was it? Even after climbing all those stairs, there was no sight of it. Just a shrine, impressive as it was, that was still too small to house a 58 ft statue, a few mandapas and … more steps. Up those steps, and through a gated passage and still no sight of the statue. We found ourselves at a temple courtyard which overlooked the village far down below and the adjacent Chandragiri hill with its umpteen Jain milestones. The Chandragiri is named after Chandragupta Maurya, the founder of the Mauryan Dynasty - as it's here that he renounced the world and became a Jain acetic till his dying day. 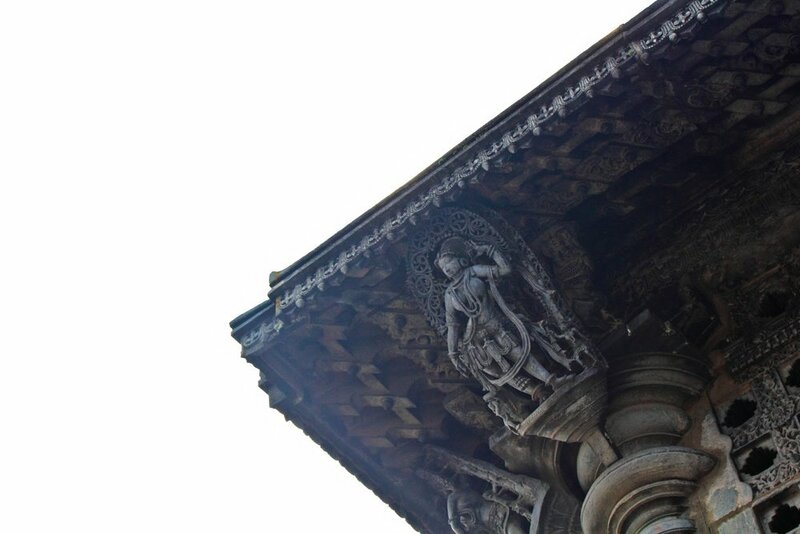 Standing against the parapet wall, we turned back to look at the temple, and we see the elusive Gometeshwara peering at us over the roof of the temple. Finally! In through another passage, and we found ourselves in a square courtyard and in the presence of Lord Gomesteshwara. Towering right in front of us, the small courtyard felt minuscule in comparison. Upon first sight, the stature appeared a little small - definitely smaller than we expected it to be. But once we got closer, I found myself wondering, rather nervously, what if that statue came to life - it certainly was not a good day for statues to be coming to life. Those fingers could effortlessly squish a person like a pea out of a pea pod. The idol reiterates Bahubali's power and physical strength. While his calm disposition plays up how removed he is from the dynamics of everyday life - that he was above his physical prowess. The Mahamastabhisheka, the once-in-12 years ceremony when the massive statue is anointed in vermillion, curd, milk, turmeric, coconut, sandalwood and even gold and silver is apparently a sight to behold. But night was dropping a curtain on the day and the priest began to prepare to end the day. The walk down seemed never-ending especially the stone steps are laid out such that one has a feeling that the slightest wind would fling you, face-first into the hollow between the two hills and right into the bottlegreen square tile that's the temple tank nestled rather prettily there. By the time we reached the foot of the hill, the hawkers selling little memorabilia and knick-knacks had shut shop and had headed home - a pity for the brass item here are worth a looky - Shravanabelagola is known for its exquisite brass figurines. Ah well, some other time, then! Gometeshwara certainly wasn't going anywhere and I certainly wanted to come back here again.